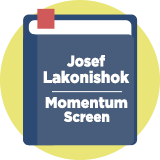 Josef Lakonishok Momentum is a strategy that uses price and earnings momentum to identify undervalued companies just at the point when the market is starting to recognise them. It is inspired by detailed research by academic and fund manager Josef Lakonishok, who co-wrote the paper Contrarian Investment, Extrapolation, and Risk. The strategy combines value and momentum factors, including the price-to-earnings ratio, relative strength and earnings surprises. Lakonishok wrote: "Regardless of the reason, some investors get overly excited about stocks that have done very well in the past and buy them up, so that these 'glamour' stocks become overpriced. Similarly, they overreact to stocks that have done very badly, oversell them, and these out-of-favour 'value' stocks become underpriced." A Lakonishok-inspired strategy tracked by the American Association of Individual Investors returned 13.9% in the 10 years to the end of 2014, versus 5.4% for the S&P 500. CEO and CIO of LSV Asset Management. Former Professor of Finance at the University of Illinois. Featured in Jonathan Burton's Investment Titans, Josef Lakonishok has published numerous papers analysing why and how value & momentum strategies can outperform the market - they are available at this link.